Kicked-up popcorn is one of my favorite easy snacks for parties, movie-watching, and even gifts! 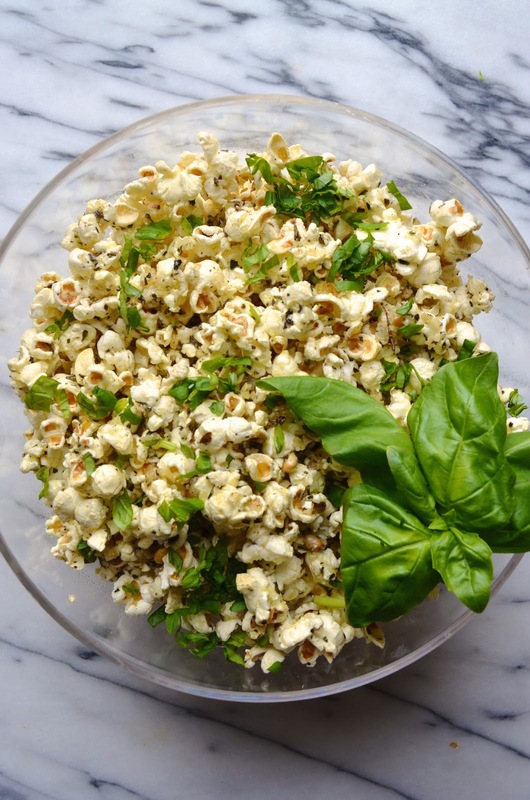 It's so simple to turn a batch of plain, freshly popped popcorn into a super fun and impressive snack with just a few easy additions. This recipe is inspired by one of my favorite childhood snacks--garlic knots! I grew up eating the pizza parlor fave of twisted dough rolled around in chopped garlic, butter, olive oil, parmesan and fresh herbs. This popcorn mixture features all the same flavor and ingredients (except the dough) in a fun and totally addictive treat. Like always, feel free to personalize this one! Add chili flakes for more heat, chop in fresh parsley or rosemary, or skip the cheese if you're not a fan. Seriously no wrong way with this quick snack. Combine butter, olive oil and garlic cloves in a small saucepan over low heat and heat until butter is completely melted and garlic is fragrant (about 2 minutes). (Keep an eye on it as it can burn quickly.) Remove from heat and let garlic infuse oil and butter at least 10 minutes (longer the better!). Place popcorn in a large mixing bowl. Pour garlic butter mixture and toss to coat well. Drizzle on a bit more olive oil, if desired. Add cheese, herbs, salt, and pepper, and toss again to coat well. Taste and adjust seasoning to taste. Garnish with fresh basil, and serve.